Early films were short films that were one long, static, and locked-down shot. Motion in the shot was all that was necessary to amuse an audience, so the first films simply showed activity such as traffic moving on a city street. There was no story and no editing. Each film ran as long as there was film in the camera. The use of film editing to establish continuity, involving action moving from one sequence into another, is attributed to British film pioneer Robert W. Paul's Come Along, Do!, made in 1898 and one of the first films to feature more than one shot. In the first shot, an elderly couple is outside an art exhibition having lunch and then follow other people inside through the door. The second shot shows what they do inside. Paul's 'Cinematograph Camera No. 1' of 1896 was the first camera to feature reverse-cranking, which allowed the same film footage to be exposed several times and thereby to create super-positions and multiple exposures. One of the first films to use this technique, Georges Méliès's The Four Troublesome Heads from 1898, was produced with Paul's camera. The further development of action continuity in multi-shot films continued in 1899-1900 at the Brighton School in England, where it was definitively established by George Albert Smith and James Williamson. In that year, Smith made As Seen Through a Telescope, in which the main shot shows street scene with a young man tying the shoelace and then caressing the foot of his girlfriend, while an old man observes this through a telescope. There is then a cut to close shot of the hands on the girl's foot shown inside a black circular mask, and then a cut back to the continuation of the original scene. Even more remarkable was James Williamson's Attack on a China Mission Station, made around the same time in 1900. The first shot shows the gate to the mission station from the outside being attacked and broken open by Chinese Boxer rebels, then there is a cut to the garden of the mission station where a pitched battle ensues. An armed party of British sailors arrived to defeat the Boxers and rescue the missionary's family. The film used the first "reverse angle" cut in film history. James Williamson concentrated on making films taking action from one place shown in one shot to the next shown in another shot in films like Stop Thief! and Fire!, made in 1901, and many others. He also experimented with the close-up, and made perhaps the most extreme one of all in The Big Swallow, when his character approaches the camera and appears to swallow it. These two filmmakers of the Brighton School also pioneered the editing of the film; they tinted their work with color and used trick photography to enhance the narrative. By 1900, their films were extended scenes of up to 5 minutes long. Other filmmakers then took up all these ideas including the American Edwin S. Porter, who started making films for the Edison Company in 1901. Porter worked on a number of minor films before making Life of an American Fireman in 1903. The film was the first American film with a plot, featuring action, and even a closeup of a hand pulling a fire alarm. The film comprised a continuous narrative over seven scenes, rendered in a total of nine shots. He put a dissolve between every shot, just as Georges Méliès was already doing, and he frequently had the same action repeated across the dissolves. His film, The Great Train Robbery (1903), had a running time of twelve minutes, with twenty separate shots and ten different indoor and outdoor locations. He used cross-cutting editing method to show simultaneous action in different places. These early film directors discovered important aspects of motion picture language: that the screen image does not need to show a complete person from head to toe and that splicing together two shots creates in the viewer's mind a contextual relationship. These were the key discoveries that made all non-live or non live-on-videotape narrative motion pictures and television possible—that shots (in this case, whole scenes since each shot is a complete scene) can be photographed at widely different locations over a period of time (hours, days or even months) and combined into a narrative whole. That is, The Great Train Robbery contains scenes shot on sets of a telegraph station, a railroad car interior, and a dance hall, with outdoor scenes at a railroad water tower, on the train itself, at a point along the track, and in the woods. But when the robbers leave the telegraph station interior (set) and emerge at the water tower, the audience believes they went immediately from one to the other. Or that when they climb on the train in one shot and enter the baggage car (a set) in the next, the audience believes they are on the same train. Sometime around 1918, Russian director Lev Kuleshov did an experiment that proves this point. (See Kuleshov Experiment) He took an old film clip of a headshot of a noted Russian actor and intercut the shot with a shot of a bowl of soup, then with a child playing with a teddy bear, then with a shot an elderly woman in a casket. When he showed the film to people they praised the actor's acting—the hunger in his face when he saw the soup, the delight in the child, and the grief when looking at the dead woman. Of course, the shot of the actor was years before the other shots and he never "saw" any of the items. The simple act of juxtaposing the shots in a sequence made the relationship. Before the widespread use of digital non-linear editing systems, the initial editing of all films was done with a positive copy of the film negative called a film workprint (cutting copy in UK) by physically cutting and pasting together pieces of film. Strips of footage would be hand cut and attached together with tape and then later in time, glue. Editors were very precise; if they made a wrong cut or needed a fresh positive print, it cost the production money and time for the lab to reprint the footage. With the invention of a splicer and threading the machine with a viewer such as a Moviola, or "flatbed" machine such as a K.-E.-M. or Steenbeck, the editing process sped up a little bit and cuts came out cleaner and more precise. The Moviola editing practice is non-linear, allowing the editor to make choices faster, a great advantage to editing episodic films for television which have very short timelines to complete the work. All film studios and production companies who produced films for television provided this tool for their editors. 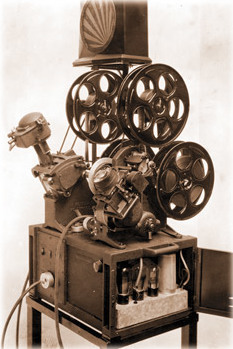 Flatbed editing machines were used for playback and refinement of cuts, particularly in feature films and films made for television because they were less noisy and cleaner to work with. They were used extensively for documentary and drama production within the BBC's Film Department. Operated by a team of two, an editor and assistant editor, this tactile process required significant skill but allowed for editors to work extremely efficiently. Today, most films are edited digitally (on systems such as Avid, Final Cut Pro or Premiere Pro) and bypass the film positive workprint altogether. In the past, the use of a film positive (not the original negative) allowed the editor to do as much experimenting as he or she wished, without the risk of damaging the original. With digital editing, editors can experiment just as much as before except with the footage completely transferred to a computer hard drive. When the film workprint had been cut to a satisfactory state, it was then used to make an edit decision list (EDL). The negative cutter referred to this list while processing the negative, splitting the shots into rolls, which were then contact printed to produce the final film print or answer print. Today, production companies have the option of bypassing negative cutting altogether. With the advent of digital intermediate ("DI"), the physical negative does not necessarily need to be physically cut and hot spliced together; rather the negative is optically scanned into the computer(s) and a cut list is confirmed by a DI editor. In the early years of film, editing was considered a technical job; editors were expected to "cut out the bad bits" and string the film together. Indeed, when the Motion Picture Editors Guild was formed, they chose to be "below the line", that is, not a creative guild, but a technical one. Women were not usually able to break into the "creative" positions; directors, cinematographers, producers, and executives were almost always men. Editing afforded creative women a place to assert their mark on the filmmaking process. The history of film has included many women editors such as Dede Allen, Anne Bauchens, Margaret Booth, Barbara McLean, Anne V. Coates, Adrienne Fazan, Verna Fields, Blanche Sewell and Eda Warren. Post-production editing may be summarized by three distinct phases commonly referred to as the editor's cut, the director's cut, and the final cut. There are several editing stages and the editor's cut is the first. An editor's cut (sometimes referred to as the "Assembly edit" or "Rough cut") is normally the first pass of what the final film will be when it reaches picture lock. The film editor usually starts working while principal photography starts. Sometimes, prior to cutting, the editor and director will have seen and discussed "dailies" (raw footage shot each day) as shooting progresses. As production schedules have shortened over the years, this co-viewing happens less often. Screening dailies give the editor a general idea of the director's intentions. Because it is the first pass, the editor's cut might be longer than the final film. The editor continues to refine the cut while shooting continues, and often the entire editing process goes on for many months and sometimes more than a year, depending on the film. When shooting is finished, the director can then turn his or her full attention to collaborating with the editor and further refining the cut of the film. This is the time that is set aside where the film editor's first cut is molded to fit the director's vision. In the United States, under the rules of the Directors Guild of America, directors receive a minimum of ten weeks after completion of principal photography to prepare their first cut. While collaborating on what is referred to as the "director's cut", the director and the editor go over the entire movie in great detail; scenes and shots are re-ordered, removed, shortened and otherwise tweaked. Often it is discovered that there are plot holes, missing shots or even missing segments which might require that new scenes be filmed. Because of this time working closely and collaborating – a period that is normally far longer and more intricately detailed than the entire preceding film production – many directors and editors form a unique artistic bond. Often after the director has had their chance to oversee a cut, the subsequent cuts are supervised by one or more producers, who represent the production company or movie studio. There have been several conflicts in the past between the director and the studio, sometimes leading to the use of the "Alan Smithee" credit signifying when a director no longer wants to be associated with the final release. In motion picture terminology, a montage (from the French for "putting together" or "assembly") is a film editing technique. In French film practice, "montage" has its literal French meaning (assembly, installation) and simply identifies editing. In Soviet filmmaking of the 1920s, "montage" was a method of juxtaposing shots to derive new meaning that did not exist in either shot alone. In classical Hollywood cinema, a "montage sequence" is a short segment in a film in which narrative information is presented in a condensed fashion. Although film director D.W. Griffith was not part of the montage school, he was one of the early proponents of the power of editing — mastering cross-cutting to show parallel action in different locations, and codifying film grammar in other ways as well. Griffith's work in the teens was highly regarded by Lev Kuleshov and other Soviet filmmakers and greatly influenced their understanding of editing. Kuleshov was among the very first to theorize about the relatively young medium of the cinema in the 1920s. For him, the unique essence of the cinema — that which could be duplicated in no other medium — is editing. He argues that editing a film is like constructing a building. Brick-by-brick (shot-by-shot) the building (film) is erected. His often-cited Kuleshov Experiment established that montage can lead the viewer to reach certain conclusions about the action in a film. Montage works because viewers infer meaning based on context. Sergei Eisenstein was briefly a student of Kuleshov's, but the two parted ways because they had different ideas of montage. Eisenstein regarded montage as a dialectical means of creating meaning. By contrasting unrelated shots he tried to provoke associations in the viewer, which were induced by shocks. A montage sequence consists of a series of short shots that are edited into a sequence to condense narrative. It is usually used to advance the story as a whole (often to suggest the passage of time), rather than to create symbolic meaning. In many cases, a song plays in the background to enhance the mood or reinforce the message being conveyed. One famous example of montage was seen in the 1968 film 2001: A Space Odyssey, depicting the start of man's first development from apes to humans. Another example that is employed in many films is the sports montage. The sports montage shows the star athlete training over a period of time, each shot having more improvement than the last. Classic examples include Rocky and the Karate Kid. Continuity is a term for the consistency of on-screen elements over the course of a scene or film, such as whether an actor's costume remains the same from one scene to the next, or whether a glass of milk held by a character is full or empty throughout the scene. Because films are typically shot out of sequence, the script supervisor will keep a record of continuity and provide that to the film editor for reference. The editor may try to maintain continuity of elements, or may intentionally create a discontinuous sequence for stylistic or narrative effect. The technique of continuity editing, part of the classical Hollywood style, was developed by early European and American directors, in particular, D.W. Griffith in his films such as The Birth of a Nation and Intolerance. The classical style embraces temporal and spatial continuity as a way of advancing the narrative, using such techniques as the 180 degree rule, Establishing shot, and Shot reverse shot. Often, continuity editing means finding a balance between literal continuity and perceived continuity. For instance, editors may condense action across cuts in a non-distracting way. A character walking from one place to another may "skip" a section of floor from one side of a cut to the other, but the cut is constructed to appear continuous so as not to distract the viewer. Early Russian filmmakers such as Lev Kuleshov (already mentioned) further explored and theorized about editing and its ideological nature. Sergei Eisenstein developed a system of editing that was unconcerned with the rules of the continuity system of classical Hollywood that he called Intellectual montage. Alternatives to traditional editing were also explored by early surrealist and Dada filmmakers such as Luis Buñuel (director of the 1929 Un Chien Andalou) and René Clair (director of 1924's Entr'acte which starred famous Dada artists Marcel Duchamp and Man Ray). The French New Wave filmmakers such as Jean-Luc Godard and François Truffaut and their American counterparts such as Andy Warhol and John Cassavetes also pushed the limits of editing technique during the late 1950s and throughout the 1960s. French New Wave films and the non-narrative films of the 1960s used a carefree editing style and did not conform to the traditional editing etiquette of Hollywood films. Like its Dada and surrealist predecessors, French New Wave editing often drew attention to itself by its lack of continuity, its demystifying self-reflexive nature (reminding the audience that they were watching a film), and by the overt use of jump cuts or the insertion of material not often related to any narrative. Since the late 20th century Post-classical editing has seen faster editing styles with nonlinear, discontinuous action. Vsevolod Pudovkin noted that the editing process is the one phase of production that is truly unique to motion pictures. Every other aspect of filmmaking originated in a different medium than film (photography, art direction, writing, sound recording), but editing is the one process that is unique to film. Filmmaker Stanley Kubrick was quoted as saying: "I love editing. I think I like it more than any other phase of filmmaking. If I wanted to be frivolous, I might say that everything that precedes editing is merely a way of producing a film to edit." [T]here is a law of natural cutting and that this replicates what an audience in a legitimate theater does for itself. The more nearly the film cutter approaches this law of natural interest, the more invisible will be his cutting. If the camera moves from one person to another at the exact moment that one in the legitimate theatre would have turned his head, one will not be conscious of a cut. If the camera misses by a quarter of a second, one will get a jolt. There is one other requirement: the two shots must be approximate of the same tone value. If one cuts from black to white, it is jarring. At any given moment, the camera must point at the exact spot the audience wishes to look at. To find that spot is absurdly easy: one has only to remember where one was looking at the time the scene was made. Assistant editors aid the editor and director in collecting and organizing all the elements needed to edit the film. The Motion Picture Editors Guild defines an assistant editor as "a person who is assigned to assist an Editor. His [or her] duties shall be such as are assigned and performed under the immediate direction, supervision, and responsibility of the editor." When editing is finished, they oversee the various lists and instructions necessary to put the film into its final form. Editors of large budget features will usually have a team of assistants working for them. The first assistant editor is in charge of this team and may do a small bit of picture editing as well, if necessary. Often assistant editors will perform temporary sound, music, and visual effects work. The other assistants will have set tasks, usually helping each other when necessary to complete the many time-sensitive tasks at hand. In addition, an apprentice editor may be on hand to help the assistants. An apprentice is usually someone who is learning the ropes of assisting. Television shows typically have one assistant per editor. This assistant is responsible for every task required to bring the show to the final form. Lower budget features and documentaries will also commonly have only one assistant. The organizational aspects job could best be compared to database management. When a film is shot, every piece of picture or sound is coded with numbers and timecode. It is the assistant's job to keep track of these numbers in a database, which, in non-linear editing, is linked to the computer program. The editor and director cut the film using digital copies of the original film and sound, commonly referred to as an "offline" edit. When the cut is finished, it is the assistant's job to bring the film or television show "online". They create lists and instructions that tell the picture and sound finishers how to put the edit back together with the high-quality original elements. Assistant editing can be seen as a career path to eventually becoming an editor. Many assistants, however, do not choose to pursue advancement to the editor, and are very happy at the assistant level, working long and rewarding careers on many films and television shows. ^ Brooke, Michael. "Come Along, Do!". BFI Screenonline Database. Retrieved 2011-04-24. ^ "The Brighton School". Archived from the original on 2013-12-24. Retrieved 2012-12-17. ^ Originally in Edison Films catalog, February 1903, 2–3; reproduced in Charles Musser, Before the Nickelodeon: Edwin S. Porter and the Edison Manufacturing Company (Berkeley: University of California Press, 1991), 216–18. ^ Arthur Knight (1957). p. 25. ^ Arthur Knight (1957). pp. 72–73. ^ "Cutting Room Practice and Procedure (BBC Film Training Text no. 58) – How television used to be made". Retrieved 2019-02-08. ^ Galvão, Sara (March 15, 2015). ""A Tedious Job" – Women and Film Editing". Critics Associated via.hypothes.is. Retrieved 2018-01-15. ^ Jacobs, Lewis (1954). Introduction. Film technique ; and Film acting : the cinema writings of V.I. Pudovkin. By Pudovkin, Vsevolod Illarionovich. Vision. p. ix. OCLC 982196683. Retrieved March 30, 2019 – via Internet Archive. ^ Walker, Alexander (1972). Stanley Kubrick Directs. New York: Harcourt Brace Jovanovich. p. 46. ISBN 0156848929. Retrieved March 30, 2019 – via GoogleBooks. ^ Hollyn, Norman (2009). The Film Editing Room Handbook: How to Tame the Chaos of the Editing Room. Peachpit Press. p. xv. ISBN 032170293X. Retrieved March 29, 2019 – via GoogleBooks. ^ Wales, Lorene (2015). Complete Guide to Film and Digital Production: The People and The Process. CRC Press. p. 209. ISBN 1317349318. Retrieved March 29, 2019 – via GoogleBooks. ^ Jones, Chris; Jolliffe, Genevieve (2006). The Guerilla Film Makers Handbook. A&C Black. p. 363. ISBN 082647988X. Retrieved March 29, 2019 – via GoogleBooks. Eisenstein, Sergei (2010). Glenny, Michael; Taylor, Richard (eds.). Towards a Theory of Montage. Michael Glenny (translation). London: Tauris. ISBN 978-1-84885-356-0. Translation of Russian language works by Eisenstein, who died in 1948. Morales, Morante, Luis Fernando (2000). Teoría y Práctica de la Edición en video. Universidad de San Martin de Porres, Lima, Perú. The Academy Award for Best Film Editing is one of the annual awards of the Academy of Motion Picture Arts and Sciences (AMPAS). Nominations for this award are closely correlated with the Academy Award for Best Picture. For 33 consecutive years, 1981 to 2013, every Best Picture winner had also been nominated for the Film Editing Oscar, and about two thirds of the Best Picture winners have also won for Film Editing. Only the principal, "above the line" editor(s) as listed in the film's credits are named on the award; additional editors, supervising editors, etc. are not currently eligible. The nominations for this Academy Award are determined by a ballot of the voting members of the Editing Branch of the Academy; there were 220 members of the Editing Branch in 2012. The members may vote for up to five of the eligible films in the order of their preference; the five films with the largest vote totals are selected as nominees. The Academy Award itself is selected from the nominated films by a subsequent ballot of all active and life members of the Academy. This process is essentially the reverse of that of the British Academy of Film and Television Arts (BAFTA); nominations for the BAFTA Award for Best Editing are done by a general ballot of Academy voters, and the winner is selected by members of the editing chapter. Angus Alexander Wall (born March 15, 1967) is a film editor and film title designer. He and fellow film editor Kirk Baxter won the Academy Award for Best Film Editing for the David Fincher film The Social Network (2010) and again the next year for The Girl with the Dragon Tattoo (2011). Additionally, he and Baxter were nominated the Academy Award for Best Film Editing, the BAFTA Award for Best Editing, and the American Cinema Editors Eddie Award for the 2008 film The Curious Case of Benjamin Button, also directed by David Fincher. Wall's title design work on the HBO television series Carnivàle and Game of Thrones both received Emmy Awards in 2004 and 2011, respectively, and his work on the series Rome's titles was nominated for the BAFTA Award in 2005. Anne Voase Coates (12 December 1925 – 8 May 2018) was a British film editor with a more than 60-year-long career. She was perhaps best known as the editor of David Lean's epic film Lawrence of Arabia in 1962, for which she won an Oscar. Coates was nominated five times for the Academy Award for Best Film Editing for the films Lawrence of Arabia, Becket (1963), The Elephant Man (1980), In the Line of Fire (1993) and Out of Sight (1998). In an industry where women accounted for only 16 percent of all editors working on the top 250 films of 2004, and 80 percent of the films had absolutely no women on their editing teams at all, Coates thrived as a top film editor. She was awarded BAFTA's highest honour, a BAFTA Fellowship, in February 2007 and was given an Academy Honorary Award, which are popularly known as a Lifetime Achievement Oscar, in November 2016 by the Academy of Motion Picture Arts and Sciences. Black Hawk Down is a 2001 war film produced and directed by Ridley Scott from a screenplay by Ken Nolan. It is based on the 1999 non-fiction book of the same name by journalist Mark Bowden. As an embedded journalist, he covered the 1993 raid in Mogadishu by the U.S. military, aimed at capturing faction leader Mohamed Farrah Aidid. The ensuing firefight became known as the Battle of Mogadishu. The film features a large ensemble cast, including Josh Hartnett, Ewan McGregor, Eric Bana, Tom Sizemore, William Fichtner, and Sam Shepard. Black Hawk Down won two Academy Awards for Best Film Editing and Best Sound Mixing at the 74th Academy Awards. In 2009, an extended cut of the film was released on DVD. The cut contained an additional eight minutes of footage increasing the running time to 152 minutes. This extended cut is set to be released on Blu-ray and in 4K on May 7, 2019. The Genie Award for Best Achievement in Editing is awarded by the Academy of Canadian Cinema and Television to the best Canadian film editor in a feature film. The award was presented for the first time in 1968 as part of the Canadian Film Awards, and was transitioned to the new Genie Awards in 1980. Since 2012 it has been presented as part of the Canadian Screen Awards. Beginning with the 3rd Canadian Screen Awards, a separate category was introduced for Best Editing in a Documentary. Christina Jean "Chris" Innis is an American film editor and filmmaker. She was awarded the 2010 Academy Award, BAFTA, and ACE awards for "Best Film Editing" on the film The Hurt Locker shared with co-editor, Bob Murawski. She is an elected member of the American Cinema Editors (ACE) and has served as an associate director on the board. In filmmaking and video production, footage is raw, unedited material as originally filmed by a movie camera or recorded by a video camera, which typically must be edited to create a motion picture, video clip, television show or similar completed work. Footage may also refer to sequences used in film and video editing, such as special effects and archive material (for special cases of this, see stock footage and B roll). Since the term originates in film, footage is only used for recorded images, such as film stock, videotapes or digitized clips – on live television, the signals from video cameras are instead called sources. Montage () is a technique in film editing in which a series of short shots are edited into a sequence to condense space, time, and information. The term has been used in various contexts. It was introduced to cinema primarily by Sergei Eisenstein, and early Soviet directors used it as a synonym for creative editing. In French the word "montage" applied to cinema simply denotes editing. The term "montage sequence" has been used primarily by British and American studios, and refers to the common technique as outlined in this article.The montage sequence is usually used to suggest the passage of time, rather than to create symbolic meaning as it does in Soviet montage theory. From the 1930s to the 1950s, montage sequences often combined numerous short shots with special optical effects (fades, dissolves, split screens, double and triple exposures) dance and music. They were usually assembled by someone other than the director or the editor of the movie. In production, a shot is the moment that the camera starts rolling until the moment it stops. In film editing, a shot is the continuous footage or sequence between two edits or cuts. Tom Cross is an American television and film editor. He began his career in 1997 as an assistant editor, contributing to such diverse projects as We Own the Night (2007), Crazy Heart (2009), The Switch (2010) and the Primetime Emmy Award-winning drama series Deadwood. He came to worldwide prominence in 2015 when he won the Independent Spirit Award for Best Editing, BAFTA Award for Best Editing, and Academy Award for Best Editing (among other honors) for his work on the acclaimed film Whiplash (2014). He has cited The Wild Bunch (1969) and The French Connection (1971) as influences on the editing of this film, and reunited with writer/director Damien Chazelle on the musical romantic comedy La La Land (2016).He is the son of Loc and Jim. His mother is from Vietnam. Unforgiven is a 1992 American revisionist Western film produced and directed by Clint Eastwood and written by David Webb Peoples. The film portrays William Munny, an aging outlaw and killer who takes on one more job years after he had turned to farming. The film stars Eastwood in the lead role, with Gene Hackman, Morgan Freeman and Richard Harris. Eastwood stated that the film would be his last Western for fear of repeating himself or imitating someone else's work.The film won four Academy Awards: Best Picture and Best Director for Clint Eastwood, Best Supporting Actor for Gene Hackman, and Best Film Editing for editor Joel Cox. Eastwood was nominated for the Academy Award for Best Actor for his performance, but he lost to Al Pacino for Scent of a Woman. The film was the third Western to win the Oscar for Best Picture, following Cimarron (1931) and Dances with Wolves (1990). Eastwood dedicated the film to directors and mentors Sergio Leone and Don Siegel. In 2004, Unforgiven was added to the United States National Film Registry of the Library of Congress as being deemed "culturally, historically, or aesthetically significant". Video editing is the manipulation and arrangement of video shots. Video editing is used to structure and present all video information, including films and television shows, video advertisements and video essays. Video editing has been dramatically democratized in recent years by editing software available for personal computers. NLE software is typically based on a timeline interface paradigm where sections of moving image video recordings, known as clips, are laid out in sequence and played back. The NLE offers a range of tools for trimming, splicing, cutting and arranging clips across the timeline. As digital NLE systems have advanced their toolset, their role has expanded and most consumer and professional NLE systems alike now include a host of features for colour manipulation, titling and visual effects, as well as tools for editing and mixing audio synchronized with the video image sequence. Once a project is complete, the NLE system can then be used to export to movie in a variety of formats in context which may range from broadcast tape formats to compressed file formats for the Internet, DVD and mobile devices. Walter Scott Murch (born July 12, 1943) is an American film editor, director and sound designer. With a career stretching back to 1969, including work on Apocalypse Now, The Godfather I, II, and III, American Graffiti, The Conversation, and The English Patient, with three Academy Award wins (from nine nominations: six for picture editing and three for sound mixing), he has been referred to by Roger Ebert as "the most respected film editor and sound designer in the modern cinema." William Goldenberg (born November 2, 1959) is an American film editor. He has more than twenty film and television credits since 1992. He won the Academy Award for Best Film Editing for the film Argo (2012), and has been nominated for The Insider (1999), Seabiscuit (2003), Zero Dark Thirty (2012) and The Imitation Game (2014). He has also received nominations for nine other editing-related awards.Goldenberg has had an extended, notable collaboration with the director Michael Mann. Goldenberg has been elected to membership in the American Cinema Editors.